There are many features that simplify the whole process of printing personal checks. There is a fully functional database that stores your Payees, and many more sets of data. It is probably one of the easiest Personal Check Printing pieces of software on the market today. The cost for this software is only US$24. This gives you full usage of the program. It is a one time fee and gives you Support via email, along with all updates and upgrades for a period of one (1) year, or 365 days. The period begins at the original purchase date. Now, the program will still function after the 1st year, you will just not be available to download any of the updates or upgrades for free. The current cost for this software is only US$24. * History Transaction records for easy tracking. * Add Payees on the fly. * Store Payee account numbers/dollar amounts for re-printing same amounts or monthly bills. * Don't use complicated programs when all you want to do is print a check. What's New: Enlarged interface. Added option to increase the screen font in the program. Removed the Page totalling on the reports, as it contained a running total not a complete total. 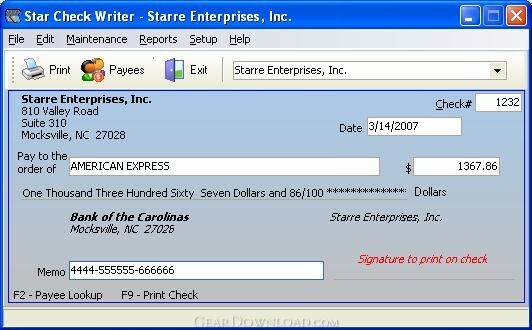 Added the ability to print a check without entering the date, or amount. Adjustments make for 120 ppi resolution systems. This download (chkwtr.exe) was tested thoroughly and was found 100% clean. Click "Report Spyware" link on the top if you found this software contains any form of malware, including but not limited to: spyware, viruses, trojans and backdoors.